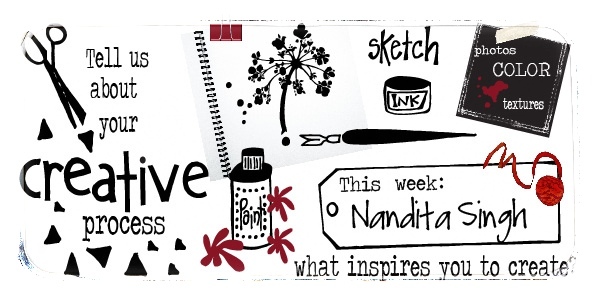 Show us your creative process Nandita Singh! No introduction needed today as Nandita has covered that for me below! She loves to talk and loves to share. Nandita comes to us all the way from India. Please drop by her lovely blog or one of her many social media site to connect with her. Check out all the places she sells her art too! 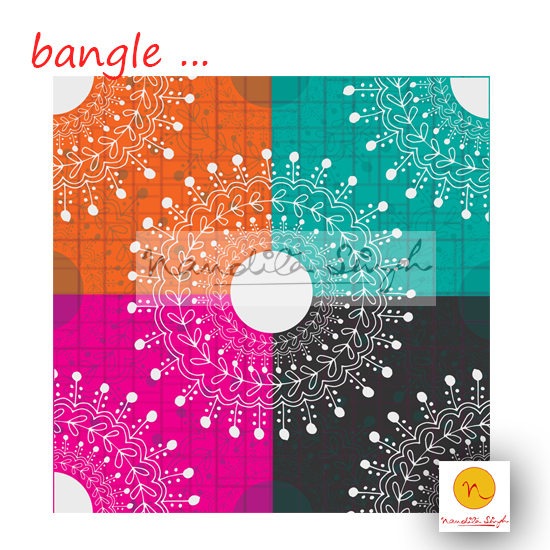 Hi all the lovely readers, I'm Nandita Singh, a freelance surface pattern designer from India. I love bright colours and so you'll often find a riot of colours in my work. I love to draw motifs --- sometimes inspired by my Indianness, and sometimes by the nature and surroundings, and sometimes (honestly) by the works of the great pattern designers too... Yes, inspiration can come from anywhere, but the final output should be yours and yours alone. 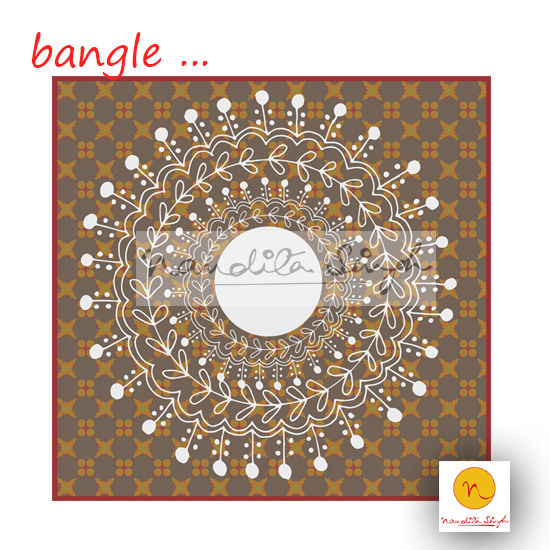 So, today here, I'll just start with my one of the latest motif that is inspired by my own collection of beautiful bangles! As you all know that we Indians love to wear colourful bangles, specially glass bangles! I made a circle first --- with the help of my own bangle which I'm wearing ( yes, that's what inspiration and motivation is), and then filled the outer border with tiny leaves and finally ending it with two more outlines. But you see I was not satisfied with this so I thought of putting some gems and semi-precious stones and pearls in the form of small and big dots and circles! Now, this was the final motif I wanted. Satisfied as I was, I tried different versions of this... Playing with different colours and techniques is very essential here, as you never know what the final result may come out to be. 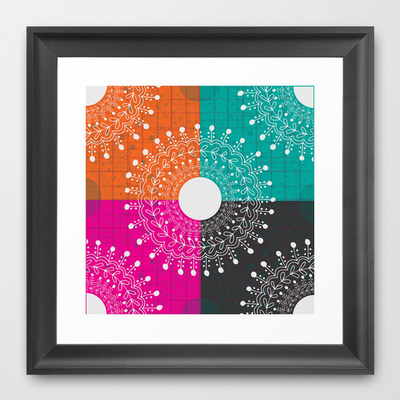 I'm happy to tell you all that you can actually buy this motif in the form of art print, framed art print and stretched canvas from my Society 6 store. 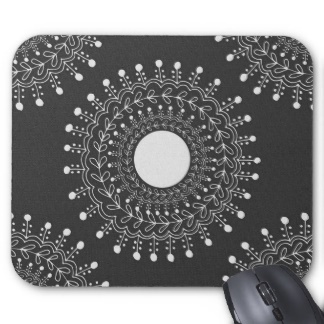 And some more home products from my Zazzle store too. 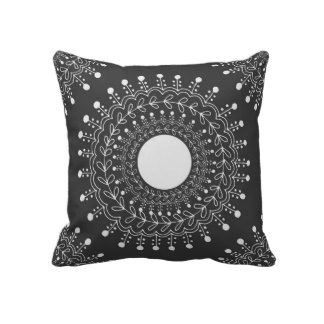 So, don't tell me you won't like to have this cute pillow as your Christmas gift ... hmm Well, if my work suits your taste then you can find me and more of my work in my blog . Thank you Nandita! I love your enthusiasm and great energy - it shows in your work and all that you do to promote your business. I am in awe of all the products that you have your wonderful art on! For more on Nandita and all the places she likes to hang around.. Facebook : https://www.facebook.com/nandita.singh.334 Twitter : https://twitter.com/nanditark Pinterest : http://pinterest.com/nanditark/surface-pattern-designs-by-me/ Flickr : http://www.flickr.com/photos/29556923@N07/ Tumblr : http://www.tumblr.com/blog/nanditark-lifeiscrafty Shop her designs/patterns as art prints, designer gadgets, fashion wear, foot wear, and homeware products Society 6 : http://society6.com/nanditarksingh Zazzle : http://www.zazzle.com/nanditarksingh Bespo : http://www.bespo.co.uk/nanditasingh/ Keka case : http://www.kekacase.com/designer-cases/nandita-singh.html Fashion Store : https://www.constrvct.com/users/nanditasingh Spoonflower Fabric store : http://www.spoonflower.com/profiles/nandita_singh Thanks for stopping by. I hope this inspires you to get some of your own artwork out there!